On Friday, February 13, 2015, the Middle East and North Africa Program at the Asan Institute for Policy Studies hosted a roundtable with H.E. Dr. Riad Malki, Minister of Foreign Affairs of Palestine. One of the Arab world’s leading statesmen, Dr. Malki has been at the forefront of negotiations on a two-state solution and also seeking international recognition for Palestine. This special event invited Dr. Malki to discuss the current state of Palestine’s foreign relations, prospects for a lasting, durable peace in the region, and opportunities for closer cooperation between Korea and Palestine. Remarks by H.E. Dr. Riad Malki, Foreign Minister of the State of Palestine at The Asan Institute for Policy Studies. It is delightful for me to be here today and to have a chance to exchange some views with you all. When we talk about the Palestinian issue, it happened that when we agreed with Israel to sign the so-called “Oslo Agreement,” it was proposed that this was supposed to be a transitional agreement: a transitional agreement that would deliver at the end of it a resolution towards statehood. And we never thought that a transitional agreement that should last for only five years, to prepare for institutional building and for human resource capacity building, will stay forever. We always thought that by 1991, 1999, the Palestinian state should emerge. That was the agreed upon conclusion when we first signed that agreement. We were preparing ourselves for announcing the establishment of a state in 1999. It happened that when we reached 1999, and we were prepared to announce a Palestinian state, the Israeli Prime Minister at that time, Ehud Barak, threatened to reoccupy the entirety of the Palestinian land in the case we dared to announce the end of Oslo and the establishment of a Palestinian state as a result of that agreement. So, many friendly and non-friendly countries put tremendous pressure on us to prevent us from making any such declaration. As a result, we have lost the opportunity that has existed: that by 1999, we could reach an end to that transitional agreement, which is the Palestinian Authority, and move into statehood. ** Please see the pdf attachment above for the rest of Dr. Malki’s opening remarks. H.E. Dr. Riad Malki is the Minister of Foreign Affairs of the Palestinian Authority. 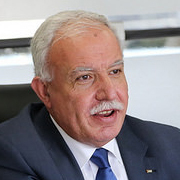 First appointed in September 2007, Dr. Malki is the Palestinian Authority’s longest serving foreign minister, having been reappointed in May 2012 and October 2013. Previously, Dr. Malki served as Minister of Information and the official government spokesperson from September 2007 to June 2009. He also served as Minister of Justice from June 2007 to August 2007. Outside government, Dr. Malki was the general director and founder of the Panorama Center for the Dissemination of Democracy and Community Development in Palestine from 1991 to 2007. He was also a professor at Birzeit University where he taught civil engineering for over 15 years from 1981 to 1996, and was a member of the steering committee of the Orient House in Jerusalem. A long-time democracy activist, Dr. Malki is also the coordinator of the Arab Program for Democracy Promotion and Development, a member of the steering committee of the World Movement for Democracy, and a council member of the Pugwash Conferences for Sciences and World Affairs, which received the Nobel Peace Prize in 1995. Dr. Malki was awarded the European Peace Prize in 2000, the Democracy Courage Award in 2004 in South Africa, and the Italian Peace Prize Lombardi region in 2005. Dr. Malki received a B.Sc. in Civil Engineering from Pontificia Universidad Catolica Javeriana, Colombia, an M.Sc. in Transportation, Planning, and Engineering and his Ph.D. in Civil Engineering, Application of Artificial Intelligence, from Polytechnic University, New York.